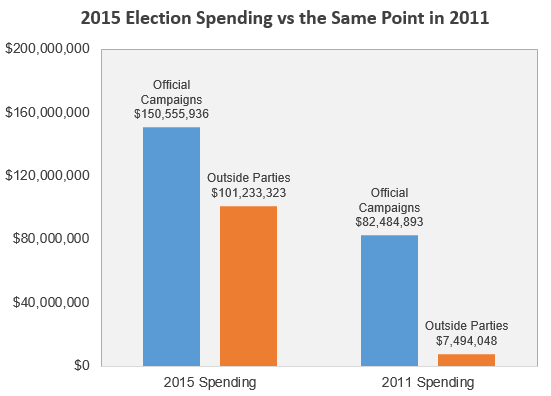 Official campaign spending is 2x higher vs this point in 2011. Spending by outside parties is nearly 14x higher. A few months ago, I posted an analysis of how the 2016 presidential campaigns were spending their money, based on disclosures to made the Federal Election Committee. These disclosure reports offer a fascinating glimpse into the strategies of each campaign. However, they are published only once per quarter, so much of the information is stale by the time the FEC makes it available. But, one distinguishing feature of this election cycle is the rise of spending by outside parties. Thanks to the Citizens United Supreme Court decision, super PACs and other organizations / individuals not affiliated with the official campaigns have spent nearly 14 times more in this election compared to the same point in 2011. And unlike official campaign expenses, outside parties are required to disclose their spending in real time. What do outside parties buy with this money? Primarily advertising and other media, either supporting or opposing a particular candidate. To their credit, outside spenders in this election have so far put most of their money toward positive promotions. 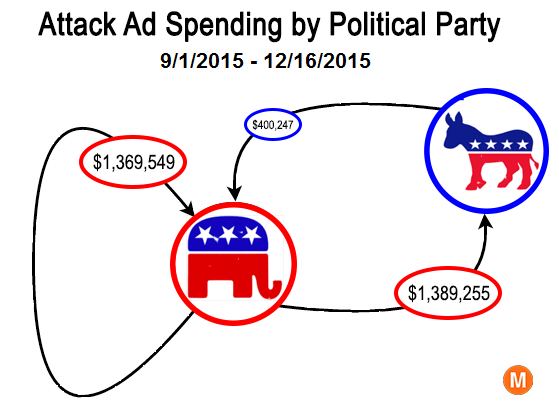 Of the $101 million they’ve spent, only $6 million went toward negative ads. However, the negative ads tell a more interesting story. 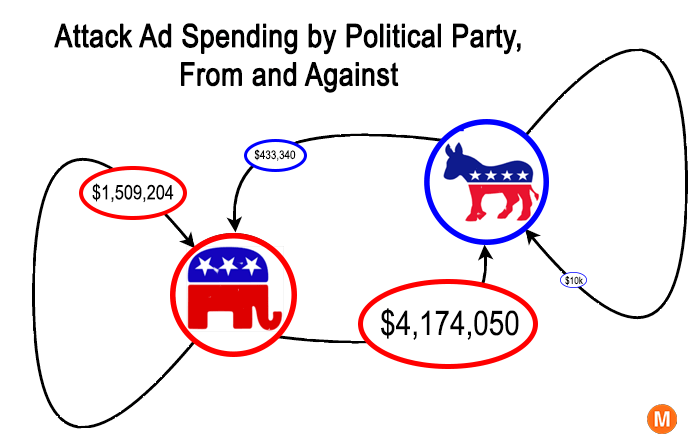 The visualization below shows a summary this election’s spending on negative ads: who is paying for them and against which candidates. Press the start button to see the progression since April. Breaking the data down by political party, of the spender and of the targeted candidate, the graphic below shows the totals. On negative advertising, conservative outside parties have outspend liberals $5,683,253 vs $443,340, with a large portion of that spending targeting other conservatives. And here is the same graphic, looking only at the spending since the beginning of September. Since September, conservative outside parties have spent as much on negative ads against other conservatives as they have on ads against Democrats. This may not be surprising, since the Republican primary is a tight race with several viable candidates, whereas the Democrat’s candidate has in effect already been chosen. But the spending does highlight the ideological divide occurring within the Republican party, a divide embodied by Donald Trump. Just this month, two new conservative outside spenders have emerged with ad campaigns targeting Trump. New Day For America, a super PAC supporting John Kasich, just announced a $2.5 million anti-Trump ad campaign backed by several large, unnamed conservative donors. Here is the campaign’s first ad, which ominously compares Donald Trump to Hitler. If you would like to keep tabs on where the outside money is going in this election, you can find the information on the FEC website, updated daily. Previous Article How High Is the True U.S. Unemployment Rate? 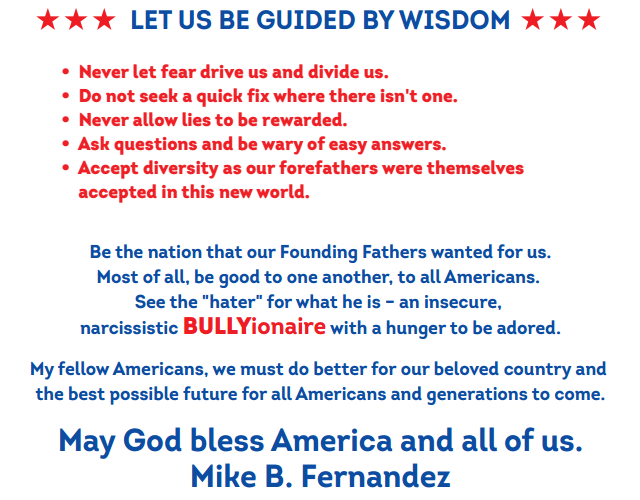 They only designate 8 Super Pacs as “Liberal” that have spent over $1000, versus 44 “Conservative” and 5 unassigned. That’s quite an impressive disparity, and makes me wonder how much Citizens v. United disproportionately helps the Conservatives. My thoughts as well. Did not imagine it would be so lopsided. Of the $101m of outside spending, conservative groups account for $95.5m! Will be interesting to see whether the trend continues in the general election.